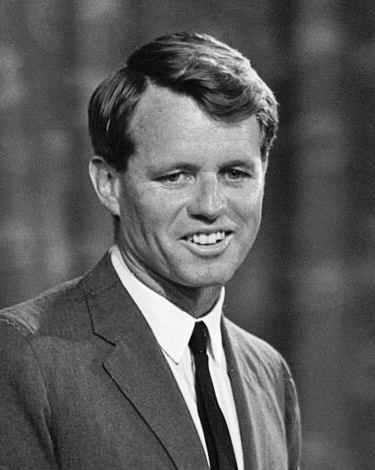 Robert Francis Kennedy was born 20 November 1925 in Brookline, Massachusetts, United States to Joseph Patrick Kennedy Sr. (1888-1969) and Rose Elizabeth Fitzgerald (1890-1995) and died 6 June 1968 in Los Angeles, California, United States of unspecified causes. He married Ethel Skakel (1928) 17 June 1950 in St. Mary's Catholic Church, Greenwich, Connecticut, United States. Notable ancestors include Henry II of England (1133-1189), William I of England (1027-1087), Charlemagne (747-814), Hugh Capet (c940-996), Alfred the Great (849-899), Robert I of Scotland (1274-1329). Ancestors are from the United States, Ireland, the United Kingdom, Scotland, Belgium, Spain, France, Germany, Portugal, Russia, Ukraine, Hungary, the Netherlands, England, Italy, Turkey, the Byzantine Empire, Sweden, Belarus.